Crater Melanthius - Universe Galaxies And Stars Section. Cassini took this photograph of the 245-km (150-mile) crater Melanthius on the surface of Saturn’s Moon Tethys. The central mountains at the heart of Melanthius are left over from when the crater first formed millions of years ago. Cassini took the photo on July 23, 2006 when it was 120,000 kilometers (75,000 miles) from Tethys. 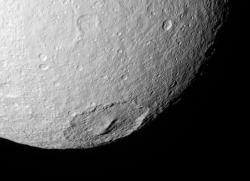 Crater Melanthius on Tethys. Notable here is a distinct boundary in crater abundance - the cratering density is much higher in the farthest western terrain (left side of the image) than elsewhere. North on Tethys (1,071 kilometers, or 665 miles across) is up and rotated 45 degrees to the left.